At this moment HelloFresh is the leading meal delivery service in Europe, that brings fresh meal and dinner kits filled with farm-fresh ingredients to every doorstep, in countries like, The Netherlands, Belgium, Germany, Austria, the UK and so on. The success of this from origin German company is partly due to the good concept of an oiled marketing machine and their worldwide operation. In the united States HelloFresh is clearly not the first and the only meal delivery service. Where they have opened the market in Europe for a lot of other farm-fresh delivery services, in the US HelloFresh is just one of many in this segment. Although they joined the US market much later, they are clearly one of the best selling meal delivery services around, with their quality meal and dinner kits, that are filled with farm-fresh ingredients from US soil they are worthy competitors of Blue Apron, Plated and Marley Spoon to just name a few. The purpose of HelloFresh is to offer fresh easy home cooking meals that everybody can cook in +/- 30 minutes and serve on the table. The HelloFresh meal kits offer healthy recipes with fresh ingredients, all recipes have several important characteristics, and the recipes are particularly healthy and fast, most of the recipes can be made within 30 minutes. In this way they want to adapt in this fast-paced society to the hard-working families who often have little or no time to cook healthy. Healthy cooking requires a lot of attention as it made us easy with all the unhealthy ready to go meals in the supermarkets. HelloFresh does all this work for you, she thinks every week of surprising chef-inspired recipes with fresh and often organic products from the region. They deliver it to your home doorstep or another address of your choice with a clear recipe instruction, the only thing you have to do is to prepare these easy meals, and enjoy them with your partner or family. This way you will eat very healthy without all the effort of going to the groceries store and thinking of healthy meals. The HelloFresh Food Subscription Boxes. 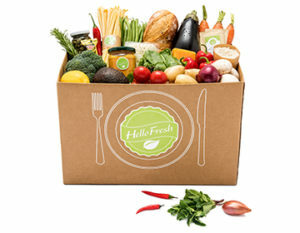 Hello Fresh has 3 different food subscription boxes to choose from, with the different food boxes to choose from they are giving option to consumers to choose for, vegetarian boxes, but HelloFresh also thought of children with a Family Box. With each food box you can specify for how many people it must be and for how many days of meals you want. Before we head over to the price of each box, lets take a closer look at each available box. HelloFresh Classic Box is the most common of the dinner kits that HelloFresh offers, this is the best sold box in their assortment, The Classic Box contains precised measured ingredients for 3, 4 or 5 meals. Delivered to your door weekly, with new fresh and healthy varied and inspiring recipes. Price starts at $ 69,- for 2 people with 3 meals. With the Veggie Box the company wants to pay attention to people who are not into meat and fish, this box for herbivores includes 3 meals every week for 2 or 4 people. With the Veggie Box there is no option to choose the amount of meals you receive every week, this is always a standard of 3 meals, but you can choose whether to go for 2 or 4 people. Price starts at $ 59,- for 2 people with 3 meals. 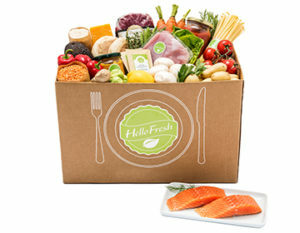 The Family Box is the latest addition in the box assortment of HelloFresh, just like many of the competitors in this market, who have the option to order a farm-fresh family box, HelloFresh clearly could not stay behind on this. Therefor you can order the Family Box with child friendly recipes that are even easy to cook as the recipes in all other boxes. You will find more recipes that are more likely to be eaten by little children and contain less spicy herbs, salt en pepper. Price starts at $ 79,95 for 4 people with 2 meals. HelloFresh delivers nationwide for free, the shipping fee is already included in the food box of your choice, all boxes are transported and delivered in special cooling vans and refrigerated trucks. When you order your first food box, you automatically sign up for a flexible subscription, that will deliver you a new box every week. You can always de-activate or pause your subscription with HelloFresh as long as you do this in time which is stated in their terms & conditions. When you are already subscribed to HelloFresh and you are receiving the Classic Box, you have the option of choosing your own meals every week. How does this work? With a running subscription you log into your online account where you can choose up to 3, 4 or 5 meals for the next week. 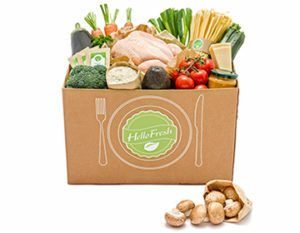 Make sure to check back here as we will provide a Discount Voucher for new coming HelloFresh customers.